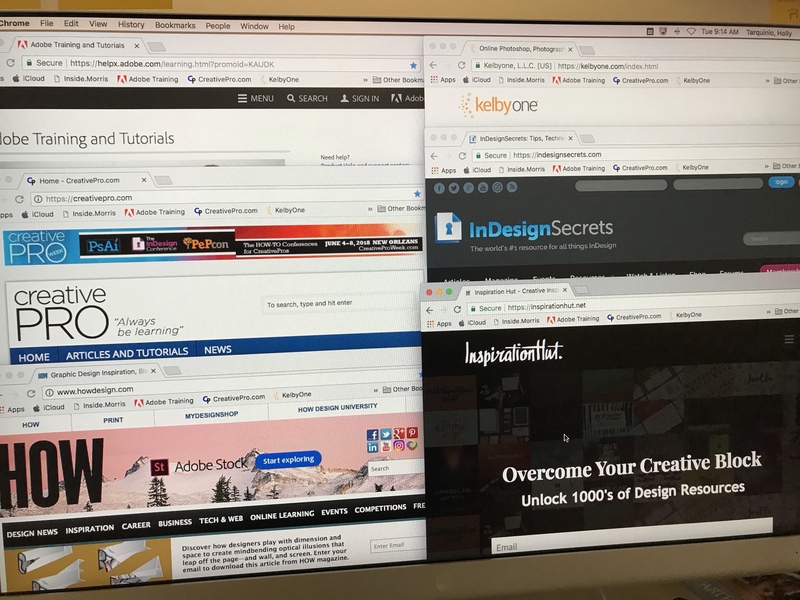 After almost 18 years as a working graphic designer, I’ve been through my share of self-educating resources. Yes, college was a valuable starting off point, but the majority of my skills developed from working out design solutions on the job. You learn very quickly in the job world that you need to constantly educate yourself on what it is you do, especially these days. As the internet took off so did the training and inspirational resources for creative professionals. Of course with the evolution of You Tube, everyone seems to be an expert. I confess, I’m not a You Tuber. I occasionally watch a funny video or search for blooper reals of my favorite shows, but that’s it. I follow most of my resources through Facebook or E-mail subscriptions or by being a member. None-the-less, over the years I have come to find reliable, professional resources to keep up to date on skills, tips, tricks and industry goings-on. These are some of the sites, groups, and individuals I follow and or hold membership with to keep up on the latest software and hardware updates, design tips and tricks. I’ve been a member of Kelbyone since 2006 when it was NAPP (National Association of Photoshop Professionals) Tutorials, live seminars, magazines, discounts and a great new online community. These days they do seem to be more geared towards photographers, but I’ve learned alot about what makes a good photo and its helped me in my job on a daily basis. I’m always picking, choosing and editing images for layouts, that other photographers have shot. I also learn alot about retouching here. I’ve followed InDesign Secrets online for years. This group became most helpful when I made the switch from packaging to publishing a few years ago. The magazine is full of great articles and the podcasts from Anne-Marie Concepcion and David Blatner are funny and educational. One of these years I’m gonna make it to the InDesign Conference. Speaking of which…. It’s where I found InDesign Secrets. While search for tutorial resources years ago I found Creative Pro and visited the website religiously. Its evolved over the years but it’s still a great resource for graphic designers. They run the big Creative Pro week which includes the InDesign Conference. Adobe Guru extraordinaire. He’s a techie/design/photo specialist I discovered through Kelbyone. He live streams design tutorials on Facebook these days. And he’s an amazing photographer as well. Good stuff. I also follow Adobe Photoshop, Illustrator and InDesign all on Facebook. They all post software specific content. Great for quick learning. And again speaking of which…. When in doubt, go to the source. Sometimes asking the folks who created the software you’re working in daily helps. I had a subscription to PRINT for about a year during college. Back then PRINT was the go to resource for designers. This was just on the cusp of desktop publishing, so the web resources just weren’t there yet. But, being in college we were broke most of the time so the subscription fell to the way side. Thank goodness for the Library. Luckily, things eventually got going online and that’s why I’ve followed HOW on and off for years. Mostly to keep up with my Apple addiction. I used to be a hybrid designer, Mac & PC capable but several years ago I moved mainly to Apple. I just like it. I’m pretty sure I could work my way through a PC if needed, but I’m not as fluent as I once was. Those Surface Pros are intriguing, but give me a Mac anytime. I don’t believe a laptop needs to be all things, it can just be a laptop. And I work with a desktop Mac Pro in the office anyway. I’ve managed my Linked In account for years. There’s lots of great content on the feed these days. You can even include portfolio images. And, now that they own Lynda training they’ve got a leg up on educating. I lost access to my Lynda account when my cemployer dropped the corporate access, so I haven’t utilized Lynda in a while. But it seems like you can learn anything there. I used to follow Deke McClelland there. Now I access him through an email subscription to his new improved site. Lots of amazing inspiration can be found here. The website is extremely clean. So clean that sometimes it tough to tell whats an ad and whats content. But I still like it and refer to it several times a week just to see whats going on. When I was in packaging I spent a lot of time on this site. I still take a glance every now and then, amazing things happening in packaging these days. This site mostly makes me feel like an under achiever when it comes to illustration. Ha Ha, but seriously, they find and show case amazing artists here. My newest resource is Insta. I’ve found myself following lots of other designers here, getting a glimpse at work from all over the world. I’ve been on Facebook for years. Though I do follow design stuff and hobby topics on FB, otherwise its reserved for real family and friends scattered about the country. Last but not least the newest podcast to hit my iTunes library, “He Shoots, He Draws.” photographer, Glyn Dewis and graphic designer Dave Clayton are 4 podcasts into one of the funniest and relatable weekly conversations I’ve ever been privy too. The cheeky british humour alone is worth the listen. But seriously these guys know what they’re doing and they’re good at it. Check them out, its worth your time. Now these by far are not the only resources out there, these are just the resources I have come to know and find reliable. If you’re looking to learn consider the source. Look at the work they produce not just the classes they teach. And don’t think you can’t learn anything by watching tutorials on topics other than what you’re designing (or whatever it is you’re creating). Some of my best design layouts have come from photography inspiration. I don’t consider myself a great teacher. I have difficulty sharing the knowledge I have with others. I do however like to share what I find when I find it. And I have no problem working with a team to solve design problems. So consider this my sharing of resources for the betterment of design. If there’s any others out there that you use and you want to share, feel free to contact me. My best personal advice? After its all said and done, practice makes you good. Practice makes you competent and valuable in your chosen profession. Whether it’s for a real client or just yourself, whether you’re designing, writing or photographing something or even just knitting, creating things over and over again leads to great results. Next Is it really March? A great wealth of resources for those in the biz. Last year I wanted to learn InDesign. I even looked up some tutorials and it looked somewhat easy. But then things happened and I never got to it. Never stop learning. Great motto.